In The New Libya, Lots Of Guns And Calls For Shariah Moammar Gadhafi suppressed everyone who posed a potential threat, including Islamists. 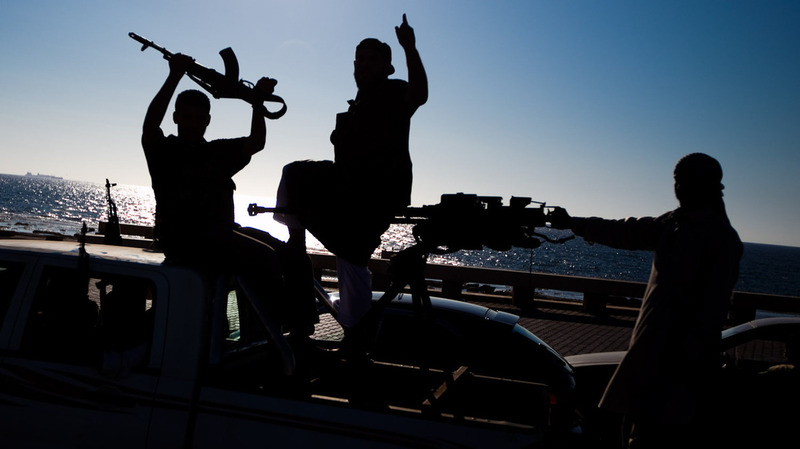 Today, Islamists are vying with secular groups for supremacy in post-Gadhafi Libya. 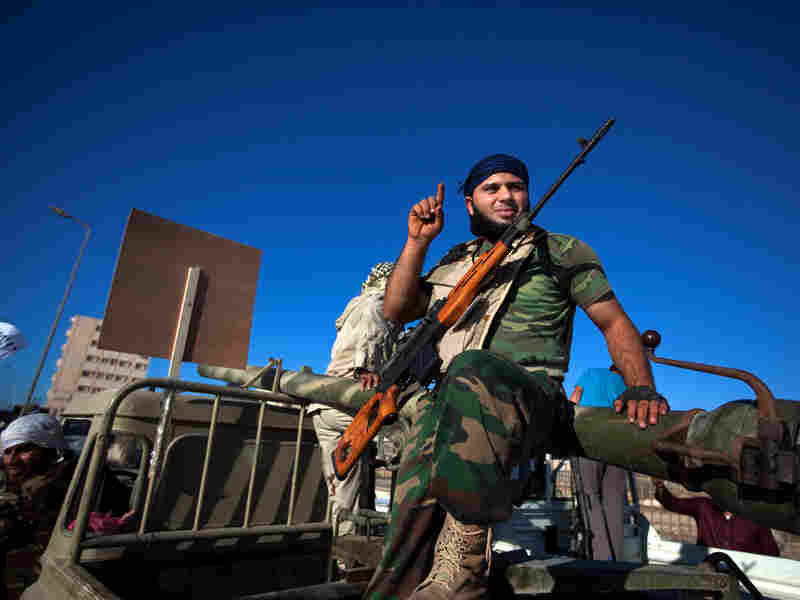 Derna, outside Benghazi in eastern Libya, is one of the battlefields. Libyans rally in favor of Shariah law, in Benghazi, eastern Libya. The city was the birthplace of the uprising that ousted Moammar Gadhafi. Morning Edition host Steve Inskeep is taking a Revolutionary Road Trip across North Africa to see how the countries that staged revolutions last year are remaking themselves. Steve and his team are traveling some 2,000 miles from Tunisia's ancient city of Carthage, across the deserts of Libya and on to Egypt's megacity of Cairo. In the Libyan towns of Benghazi and Derna, he talks to Islamists about their desire to see a new Libya ruled by Shariah law. The other day in Benghazi, Libya, we found our vehicle surrounded by truckloads of men with machine guns. They were waving black flags, which are associated here with radical Islam, and they were shouting "Allahu akbar," or "God is great." At the time, we were driving to see a protest — but it seemed the protest had found us. These gunmen were the protesters, so we continued on, surrounded by scores of honking pickup trucks with anti-aircraft guns welded to the beds. The rebel fighters from Libya's revolution had brought their weapons along while demanding that their country impose Shariah, or Islamic law. The protesters came from several cities in eastern Libya. Some drove 180 miles from Derna, a Libyan city known for producing radicals. When several trucks pulled over, we did, too, and chatted with a gunman. He told us he was marching to demand Shariah and "to kill the infidels." Weapons were openly displayed at the demonstration. He walked away before we could get his name, a youth with a Kalashnikov rifle strapped over his shoulder and a black flag on a stick attached to his back. It's worth keeping this rhetoric in perspective: The young man did not take the opportunity to kill the non-Muslim right in front of him. Still, some Libyans were stunned to see so large an arsenal at a political demonstration. As we drove along, a man on the street recognized our Libyan interpreter. He came running to catch up with us and leaped in the front seat, ranting about the armed Islamists. "If you want to rule by Islam, it's not like that," the man says. "Even our Prophet Muhammad is not behaving like that. It's written in our Quran ... if you want to rule by religion, you have to rule by peace, not by gun, or something like that." This man is famous in Libya: Massoud Abu Assir, a singer who played in the rebels' front lines during the revolution. He remembers religious conservatives harassing him then. "These people, even in the front line, when I play with my guitar, always they come to make problem with me; they don't want me to sing in the front line," he says. "Always." Abu Assir did not want U.S. ground troops to come to Libya during the uprising. But he's so upset by the Islamist demonstration that he is ready for international intervention now. "But now I agree, to see these people now, I agree to America comes to make Libya safe for at least two years, three years," he says. That's not likely to happen anytime soon, but American officials are watching closely for signs of radical activity in eastern Libya. We drove eastward to the city where many of those armed protesters live. The question that's of concern to Libyan and American officials is not whether people are Islamist: This is an overwhelmingly Muslim and conservative country that's supposed to become a democracy. The question is whether some people go outside the political process and use violence to achieve their ends. To learn more about the possibilities of that we've come to Derna, an old port city by the Mediterranean Sea, where a wonderful sea breeze is blowing the new Libyan flags on a row of flagpoles. Derna is a city with a long history of insurgent movements. People here resisted Moammar Gadhafi's regime, and a few years ago, a number of people from Derna volunteered to serve as suicide bombers in Iraq. Many men from Derna also volunteered for Libya's revolution, and the government is now trying to bring them all under a central command. We sat down with the president of the local security committee — in effect, the commander of all Derna's gunmen — Fathi El Ajib — and asked him whether he thought it was appropriate for the men under his command to take their weapons to a political demonstration in the middle of a city. This is wrong, he says. I don't agree with this. Libya doesn't need weapons to follow Islam. El Ajib is well aware that there are radicals in his city. And that led to one more question: Is there al-Qaida is Derna? There's no al-Qaida, he says, but the thought of al-Qaida, the mentality, is here. NPR Music features some of the music Morning Edition host Steve Inskeep is hearing along his travels through Tunisia, Libya and Egypt — in cafes, clubs and on local radio stations. We began talking of one such local man with strong connections to the terrorist group. According to a WikiLeaks document, the man spent time working for Osama bin Laden in Sudan and Afghanistan. The U.S. captured him, took him to the prison at Guantanamo Bay, Cuba, and later sent him, without due process of law, to a prison in Gadhafi's Libya. Now he's free, and under the name Sufiyan Qumu, he has been leading a local group of gunmen. He had been with al-Qaida, but as for whether the Libyan gunman is still with al-Qaida, the local security chief replies: How can I know? There's no country of al-Qaida, there are no people of al-Qaida, there's no military of al-Qaida. Minutes after we arrived in Derna, we heard gunfire on the streets. But it was apparently just a wedding celebration — a sign of a town that's well armed, but fairly calm. People kept right on shopping on the main street and bargaining for cars at a waterfront auto market. Residents of this city insisted to us that Derna is actually a moderate place. Abdul Karim ben Tahir, a well-connected university professor, says he's no fan of extremists. "Here, people don't like [extremists] at all. I don't deny that there are some. But here they are not liked," he says. "At the very beginning maybe some people took part in the revolution, they fought Gadhafi at the very beginning. And they were patriotic, but they don't want any law at all to govern the country. And if they take power, the country will be in a chaos." Some Derna residents have already demonstrated their view of Qumu, the man who's worked for al-Qaida in the past. At least two bombs have exploded in the city. People blamed Qumu, and the public outcry was fierce enough that he was forced to announce he was giving up command of his band of fighters. Soon the city will have another chance to clarify where it stands. Derna, like the rest of Libya, is about to elect representatives to an assembly that will write a new constitution. Those elections may show what Libyans think when they speak with votes rather than guns.